Why spend hundreds on expensive media filters that just wind up in the landfill. These permanent filters feature a lifetime warranty. They are effective replacements for 4, 5 and 6 inch thick filters from 3M, Air Bear, Airease, Air Kontrol, Amana, Accumulair, American Standard, Aprilaire, Armstrong, BestAir, BDP, Bryant, Carrier, Coleman, Comfort Plus, Complete Comfort, Day and Night, Electro-Air, Enviracaire, Emerson, GeneralAire, Gibson, Goodman, Filtrete, Five Seasons, Frigidaire, Healthy Climate, Heil, Honeywell, Janitrol, Kelvinator, Lennox, Maytag, Nordyne, Payne, Philco, Purolator, Rheem, Ruud, Skuttle, SpaceGard, Tappan, Totaline, Trane, Trion, Ultravation, Westinghouse, White Rodgers, York and others. PLEASE PHYSICALLY MEASURE YOUR CURRENT FILTER. Do not go by the size printed on the filter and this is often different than the actual filter size. Filters must be 24-5/8" or less on one side. Replace your current MEDIA FILTERS or ELECTRONIC AIR CLEANER (EAC) CELLS with our permanent, washable filter. Our filters develop a natural electrostatic charge as air passes through them...no electricity required. Just vacuum off or hose off to release the electrostatic charge and clean the filter. These extra wide filters have the same specs as our popular Air Care Electra9400 filters. PLEASE NOTE: As shown in the pictures, this filter consists of 2 inches of filter media in a thicker frame. Why not have more filter media? One might think that the thicker the media, the better the filter. However, this filter uses electrostatic media to trap particles. The media must be compacted to a specific density for the electrostatic fibers to build static electricity and attract dust. If the media layers were any thicker, it would create too much air resistance and be very hard to wash clean. 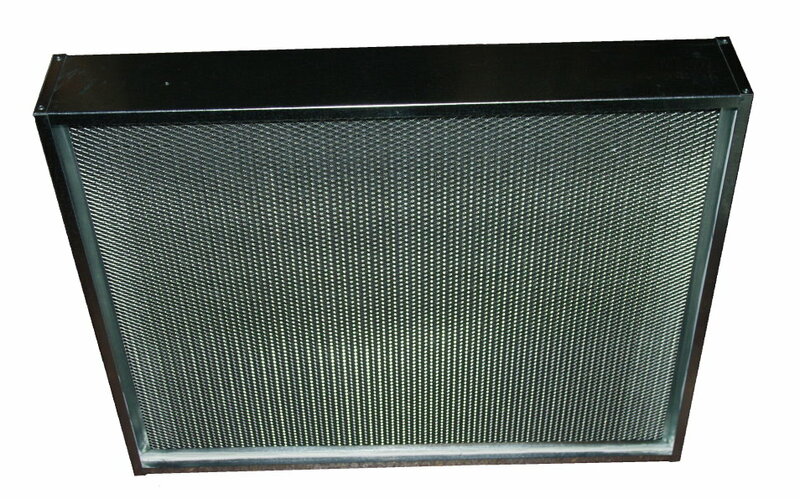 Our media replacements filters are available in thicknesses from 3-1/2 inch to 6-5/8 inch. Use the "Filter Thickness" drop down menu above to choose your current filter's exact thickness. 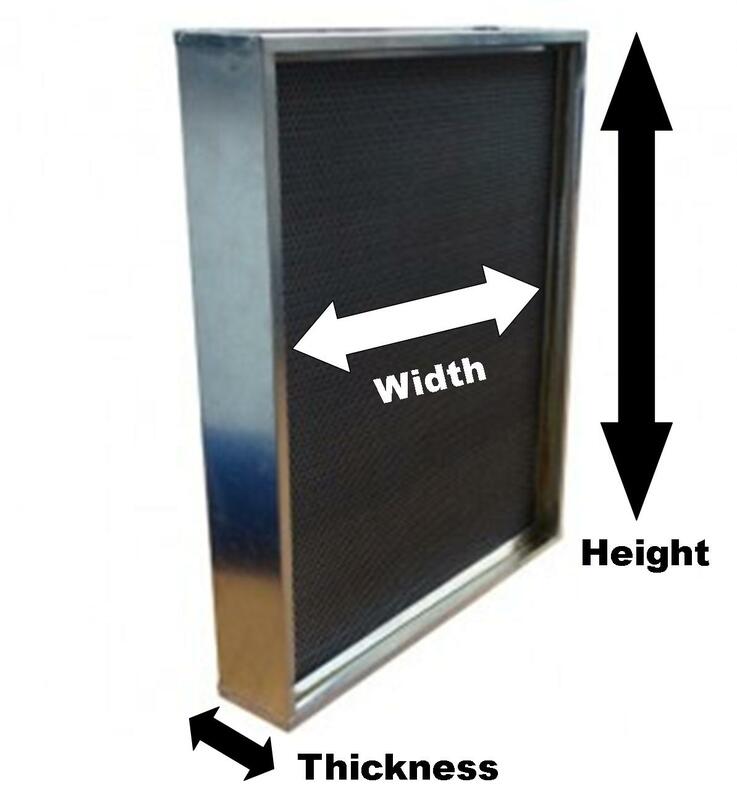 Please measure from the outside of the filter frame on each side. Enter the width and height dimensions in the "Filter Width and Height" box above (ie: 16-5/8 x 24-5/8). What is the MERV rating on your filter? These filters are comparable to a MERV 8 filter. They develop their electrostatic charge naturally as air passes through them. They do not have to be plugged in to a power source. When choosing a filter, it is important to look at dust arrestance as well as air resistance. 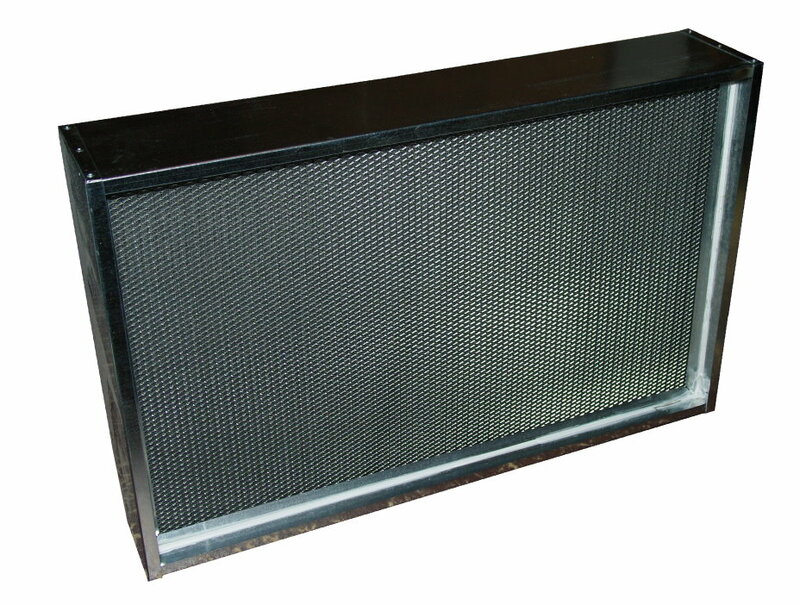 Our filters are designed to provide an excellent balance between HIGH dust arrestance and LOW air resistance. 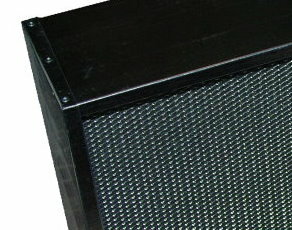 Our 4-inch Air-Care 3-Stage filters feature a very low 0.12 W.G. air resistance and excellent 94.7% dust arrestance. 1. We can make our filters in 1/8 inch increments. Please type the EXACT filter size (Width x Height) you need in the box above. 2. Your filter(s) will be custom made for you. Please double check your size as we cannot provide refunds or exchanges due to errors in measurements provided to us when ordering. When measuring the filter slot, please allow room for any metal flanges, slots and/or doors in the filter housing area. 12" X 24" X 4"
14" X 24" X 4"
14" X 25" X 4"
15.75" x 24.75" x 4.25"
15.875" x 19.875" x 4.375"
15 3/4" x 24 1/4" x 4 7/8"
15.875" x 24.875" x 4.375"
15.625" x 27.625" x 3.75"
16" x 19 3/4" x 4 3/8"
16" x 24 3/4" x 4 3/8"
16 5/8" x 26" x 4"
19.875" x 15.875" x 4.375"
19 3/4" x 24 1/4" x 4 7/8"
19.875" x 19.875" x 4.375"
19.875" x 24.75" x 4.375"
19.875" x 24.875" x 4.375"
20" x 19 3/4" x 4 3/8"
20" x 24 5/8" x 4 1/4"
20" x 24 5/8" x 4 3/8"
20" x 25.25" x 3.75"
23.75" x 24.75" x 4.375"
15.375" x 21.875" x 5.25"
15.375" x 25.5" x 5.25"
15.4375" x 21.9375" x 5.25"
16 3/8" x 26" x 5 5/32"
19.5625" x 22" x 5.25"
19.75" x 24.25" x 5"
20.25" x 20.75" x 5.25"
20.25" x 25.375" x 5.25"
22.125" x 24" x 5.25"